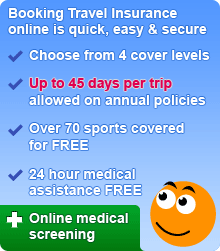 Travel Insurance - Buy Cheap Holiday Insurance for UK Residents. Web wide crawl with initial seedlist and crawler configuration from April 2012. EssentialTravel.co.uk Your Trip, Our Expertise. This site works best with cookies, which have been automatically enabled. Kids go FREE on our Family policies! You have chosen an annual policy. Annual cover starts from the start date above. Please enter the traveller age(s) in the boxes provided. Our holiday insurance policies are safe, secure, fully comprehensive and underwritten by White Horse Insurance Ireland Ltd. We cut the cost not the cover! Travel more than once a year? Annual multi trip holiday insurance is guaranteed to save you money and time. Plus, we'll give you 10% off airport parking for a year. Read full policy wording here! All copyright, trade marks and other intellectual property rights in the material contained on this web site belong, or are licensed to, Essential Travel Limited. All rights reserved. You may not copy, reproduce, transmit, store, adapt or modify any of the images, text, or content of this web site without the prior written consent of Essential Travel Limited. Essential Travel Limited has registered and dated all its content and intellectual property with a recognised copyright company and legal action will be taken if any of our licensed material is copied. Find out more about Essential Travel's fantastic win at the 2010 TravelMole Web Awards. Essential Travel is one of the UK's leading online Travel Insurance providers - giving peace of mind to hundreds of thousands of holidaymakers each year. Customers have scored Essential Travel on average 89% 100 based on 328 reviews. Prices from £6.94 for 1 week's cover in Europe. We tailor our travel insurance policies to suit all your holiday requirements. Single Trip Travel Insurance starts from £6.94 a week and Annual Insurance from £32.99. So, whether you travel regularly and require an annual multi trip policy or once in a while and need a single trip policy - we've got you covered. Get continual cover for up to 2 years on our long term or backpacker travel insurance polices. Are you a sports fanatic? We offer specialised cover for almost every sport, from scuba diving and skiing to mountaineering and trekking! With Essential Travel it's quick, easy and a secure way to safeguard your trip. Our travel insurance policies can be tailored to your individual needs, so you only pay for the protection you actually need. Plus our standard policy can be extended to include skiing and snowboarding, while our Adventure Travel Insurance covers a wide rage of more extreme sports. If on your journey you've lost your bags, your camera has been stolen, or your flight's been cancelled - we've got you covered with our holiday insurance. All our policies include access to a UK-based 24-Hour Emergency Assistance Helpline, offering worldwide multi-lingual assistance - which means that you can be sure of our support, and rely on us to be there anytime, anywhere. A pre existing medical condition doesn't mean you can't travel. You will be asked four simple questions at stage four of the booking process to assess the right kind of cover for you. For the very latest travel information - check out our Travel News articles, Travel blog and our brand new Essential Travel Magazine full of tips and advice sure to help you on your holiday. Essential Travel works with White Horse Insurance, a specialist Travel Insurance underwriter who insure 2 million people a year, and are part of the Thomas Cook PLC Group, to provide you with complete peace of mind on your holiday.